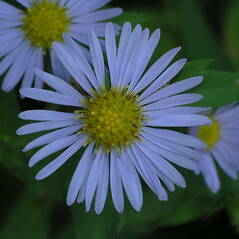 New York American-aster is a variable taxon, with three varieties are found in New England: two (Symphyotrichum novi-belgii var. novi-belgii, and var. elodes) are found on coastal and near coastal habitats plus inland riverbanks, fens, marsh edges and boggy shores; and the other (S. novi-belgii var. 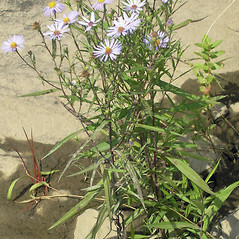 villicaule), known only from Maine and adjacent Canadian provinces, is usually found on rocky river shores. 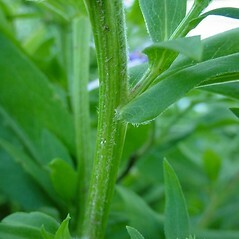 involucral bracts long-tapering at the apex and lower portion of stem hairy with stiff, spreading hairs (vs. S. novi-belgii, with involucral bracts pointed at the apex but not long tapering and lower portion of stem hairy or not, but the hairs not both stiff and spreading). 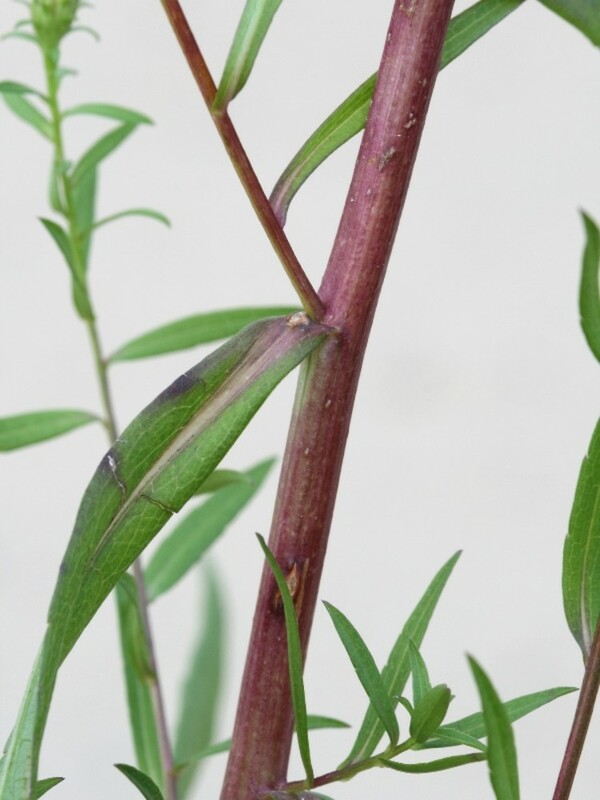 leaf blades tending to be narrow-lanceolate, scarcely narrowing to the base, folded along the midrib, coriaceous, and many peduncles longer than 3 cm (vs. S. novi-belgii, with leaf blades narrow-lanceolate to oblanceolate, narrowing to the base, flat, herbaceous to fleshy, and most peduncles shorter than 3 cm). 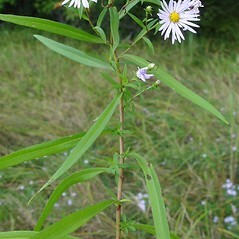 Symphyotrichum novi-belgii var. elodes (Torr. & Gray) Nesom is known from CT, MA, ME, RI.S. 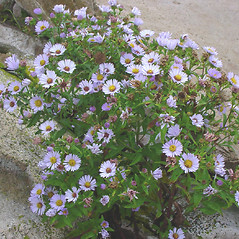 novi-belgii (L.) Nesom var. novi-belgii is known from CT, MA, ME, NH, RI, VT. S. novi-belgii var. villicaule (Gray) Lebrecque & Brouillet is known from ME, usually on rocky river shores. 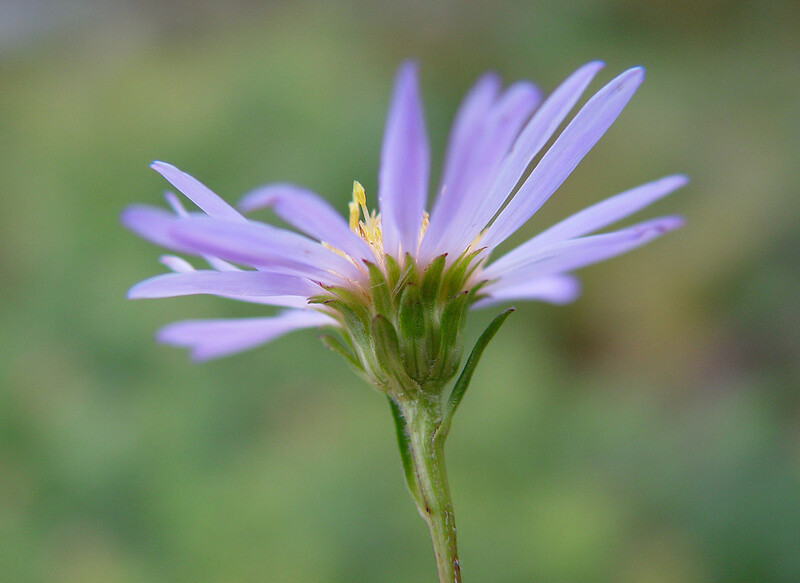 New York American-aster. 15a. 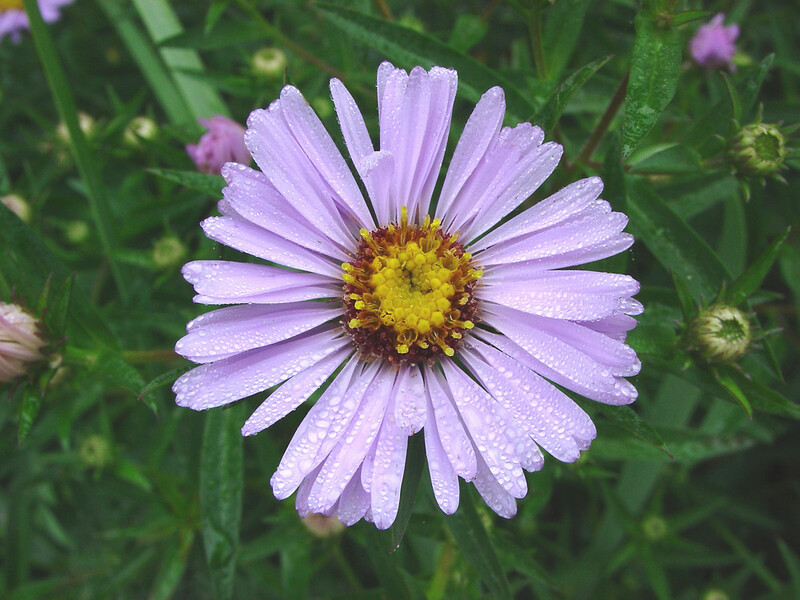 Aster elodes Torr. & Gray; A. novi-belgii L. var. elodes (Torr. & Gray) Gray; 15b. 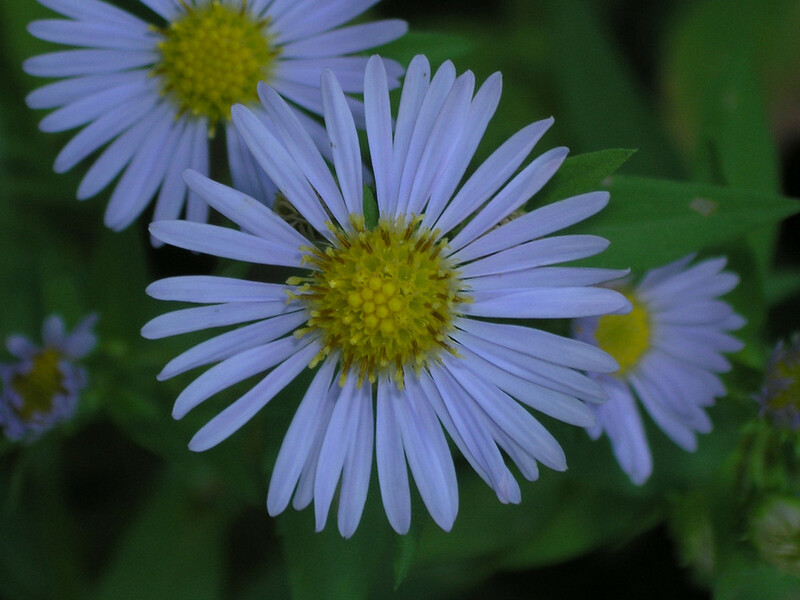 Aster johannensis Fern. 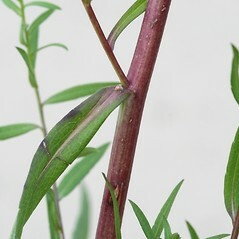 ; A. longifolius Lam. 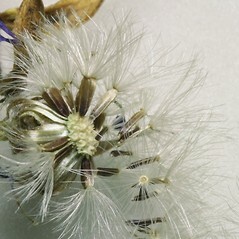 ; A. novi-belgii L.; A. novi-belgii L. ssp. 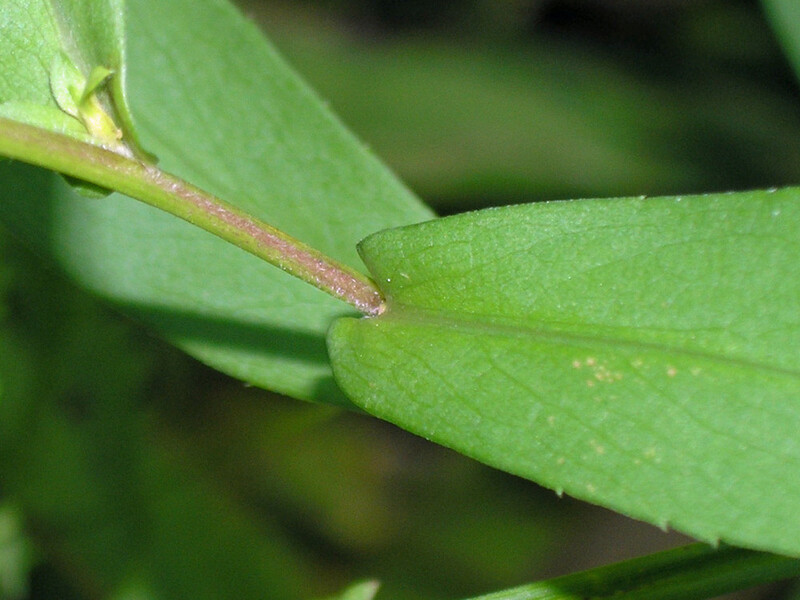 johannensis (Fern.) A.G. Jones; A. novi-belgii L. var. johannensis (Fern.) A.G. Jones; 15c. 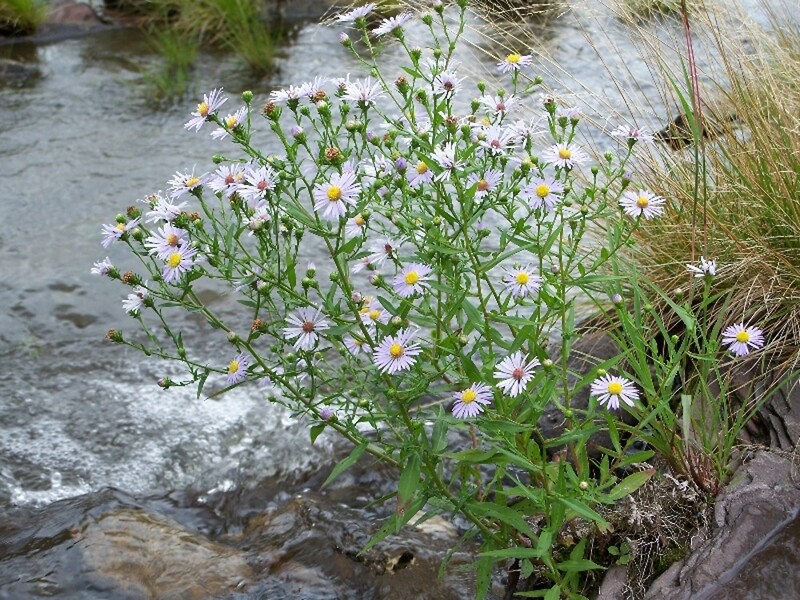 Aster johannensis Fern. var. villicaulis (Gray) Fern. 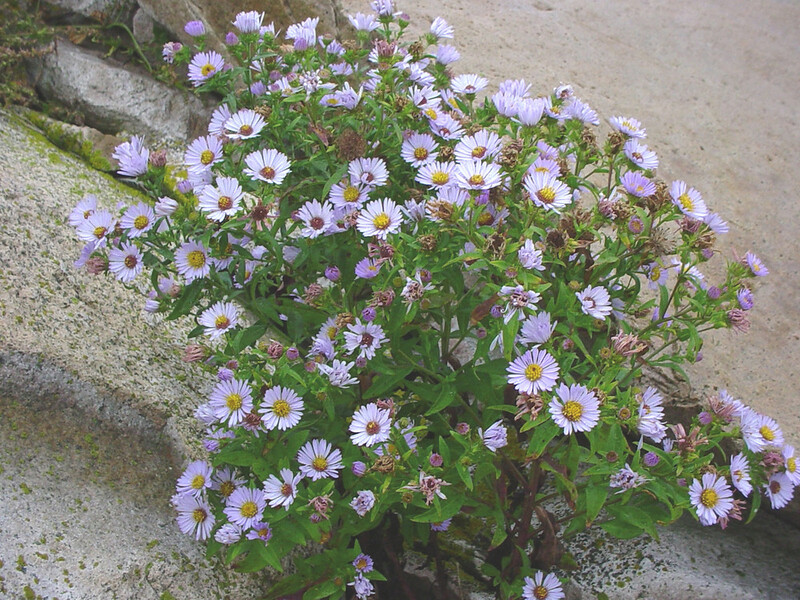 ; A. novi-belgii L. var. 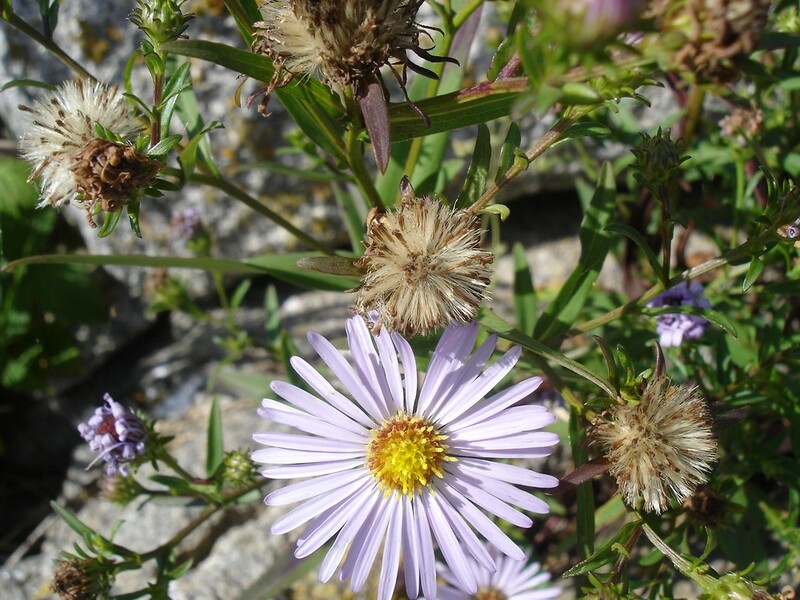 villicaulis (Gray) Boivin • CT, MA, ME, NH, RI, VT. Saltmarshes and open places near the coast, fields and forest edges, riparian and lacustrine shorelines, rarely ascending to high elevation in northern New England. 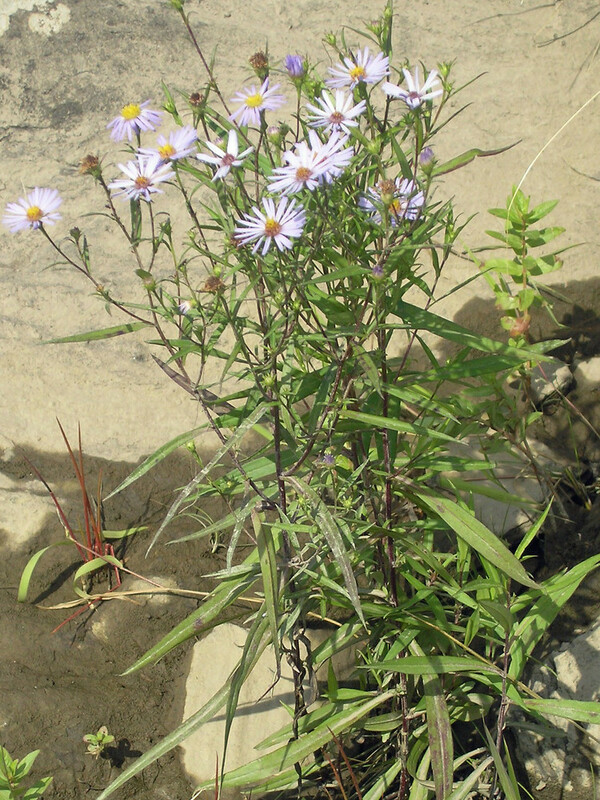 Plants from New England determined as Aster crenifolius and A. foliaceus in regional herbaria represent (in part) environmental forms of Symphyotrichum novi-belgii with elongate, foliaceous outer involucral bracts. 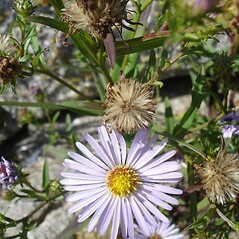 Symphyotrichum novi-belgii var. 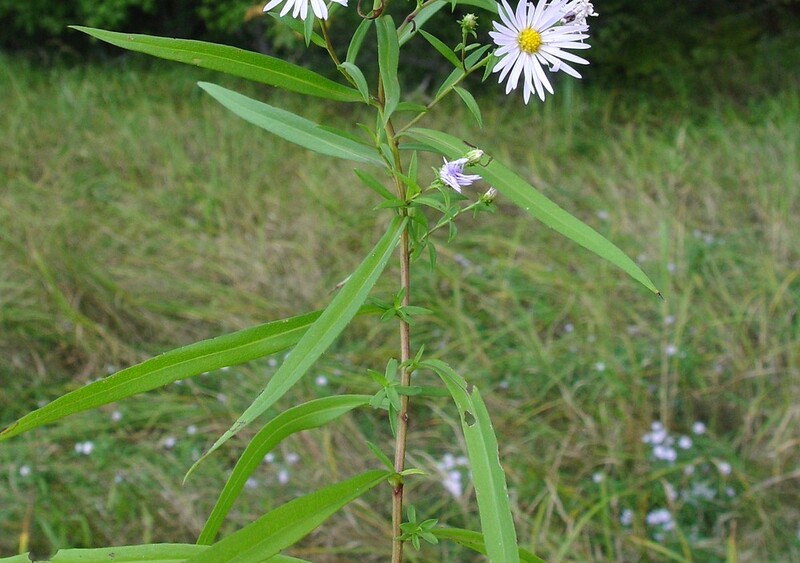 litoreum (Gray) Nesom represents a set of brackish marsh plants with thick, broad blades (relative to length). 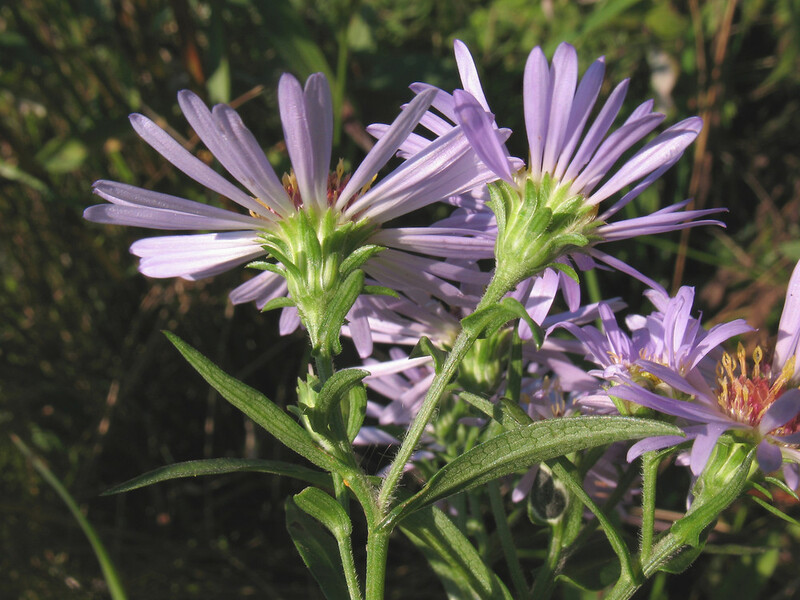 These have been considered to be the hybrid of S. laeve and S. praealtum (Labrecque and Brouillet 1996); however, this combination does not explain the coastal marsh habitat and foliaceous involucral bracts. 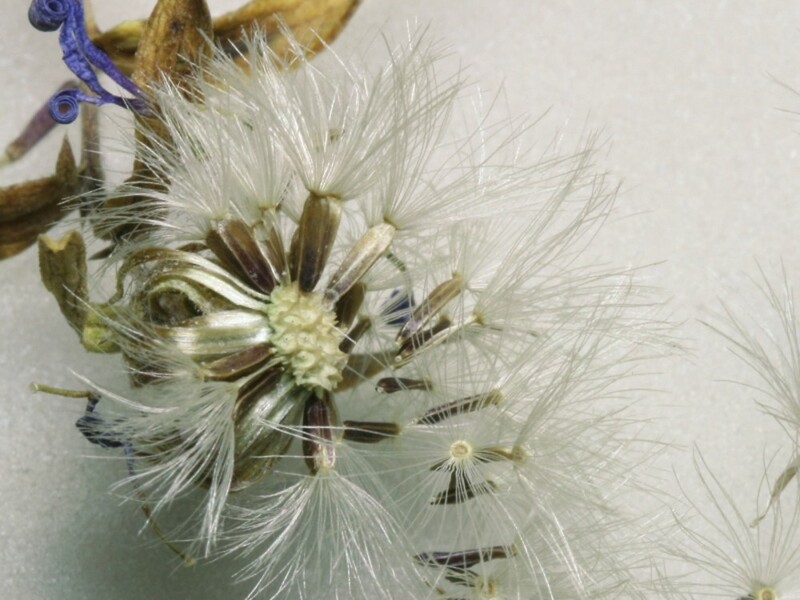 The identity of these plants is still in question. 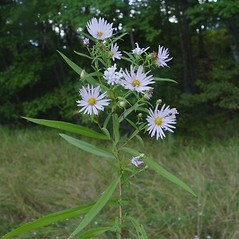 Variety elodes is known from CT, MA, ME, RI; also reported from NH and VT by Seymour (1982), but specimens are unknown. 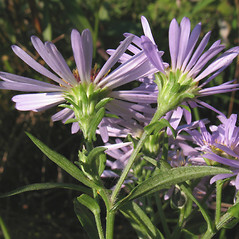 Variety novi-belgii is known from CT, MA, ME, NH, RI, VT. 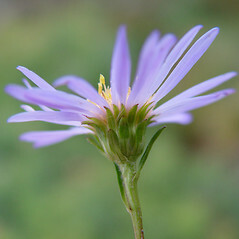 Both of these varieties are found in open, coastal, near coastal, and inland natural communities (river banks, fens, boggy shorelines, marsh edges). 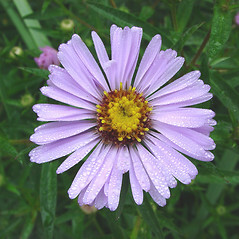 Variety villicaule is known from ME. 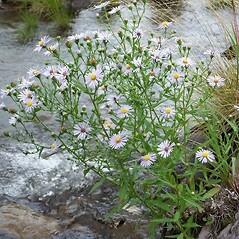 It is usually found on rocky shorelines of rivers. 6×15. 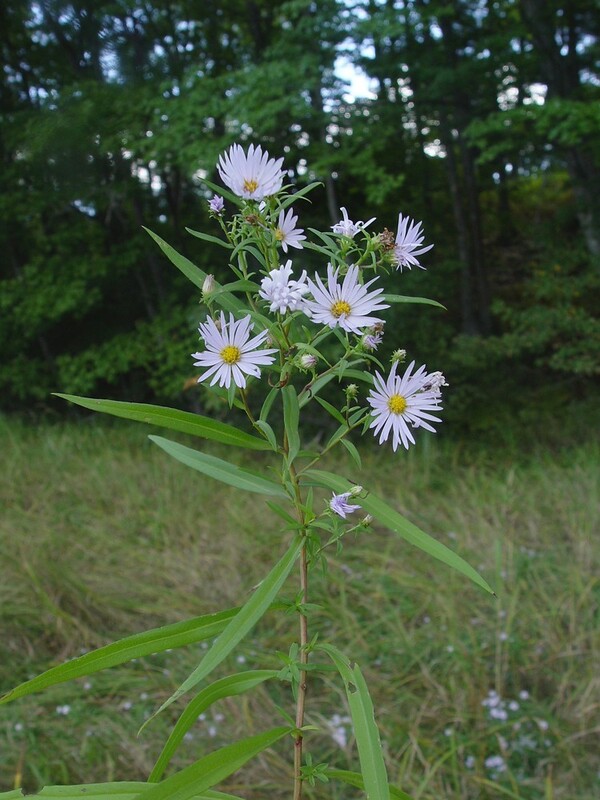 Symphyotrichum cordifolium × Symphyotrichum novi-belgii → This very rare American-aster hybrid is known from VT. 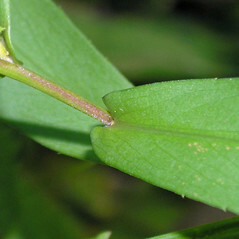 It has adaxially scabrous lower leaves with rounded leaf blade bases that are abruptly contracted to a winged petiole. 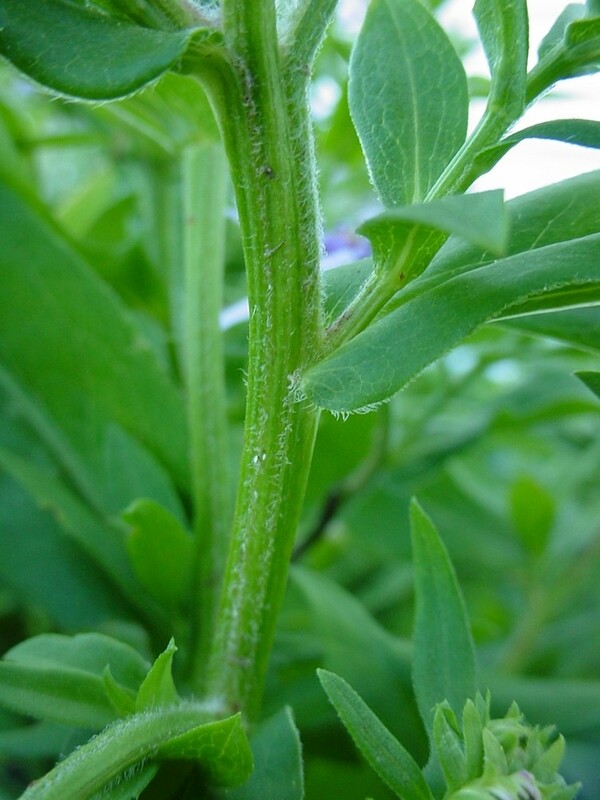 The capitula have blue rays with wider involucral bracts 0.7–1 mm wide that have a pronounced apical green zone, this sometimes representing 50% of more of the bract length (i.e., some involucral bracts are somewhat foliaceous).